ArTeMiS (Architectures de bolometres pour des Telescopes a grand champ de vue dans le domaine sub-Millimetrique au Sol) is an ESO PI project of a large bolometer camera in the submillimeter range (200, 350 and 450 μm) on APEX. 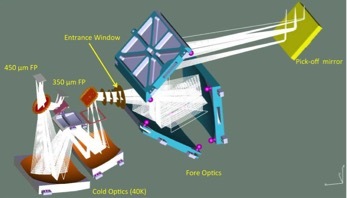 CEA-Saclay and IAS in France and the University of Manchester are developing the instrument in collaboration with ESO. 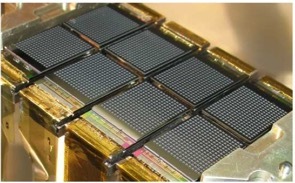 The instrument is based on the technology of bolometer arrays developed for the PACS camera on-board the Herschel Space Observatory but adapted to the high optical load encountered at APEX site. These bolometers consist in Si:P:B bolometers arranged in 16x18 sub-arrays operating at 300mK. The final instrument will contain 2x8 sub-arrays at 350 and 450 μm (and potentially 2 sub-arrays at 200 μm). They were background limited in the Herschel/PACS instrument and should provide the same performances under ground-based conditions. The first image on the right represents the ArTeMiS 350 μm focal plane used for the 2014 run at APEX (Reveret et al, 2014). The bolometers do not use feedhorns to concentrate the submillimeter light, but act more like a CCD camera. ArTeMiS can therefore instantaneously fully sample the image in the focal plane and does not require any "jiggling" pattern. The estimated gain in speed when mapping extended sources is about 3 compared to a classical bolometer array (for instance the APEX/SABOCA instrument at similar wavelenghts) with feedhorns with the same sensivity and FOV. The second image on the right represents the 3D view of the ArTeMiS all-reflective optics (Reveret et al, 2014). Visit the ArTeMiS page at CEA here. This table sums up the measured perfomances of the ArTeMiS (from Reveret et al, 2014) and P-ArTeMiS instruments. (a) : The 450 μm band will be tested in Period 95. (b) : 16 times quicker when considering the full instrument. The major observing modes available at APEX can be used with ArTeMiS. Spiral maps can be used for compact sources or to correct for pointing offsets on strong sources (planets, HII regions). For larger fields, rasters or spirals maps have been tested as well as the "On-The-Fly" mode for beam-maps or large maps.